A few weekends ago I was privileged to be invited to the Alabama Book Festival set at Old Alabama Town in downtown Montgomery. This past weekend was an epic road trip adventure through the incredible state of Alabama. Friday started with my book, Amazing Alabama, being used as decorations for the Alabama Society Daughters of the Revolution state conference on Friday afternoon. I was so incredibly honored, and the ladies all LOVED the centerpieces. After the DAR conference, Maggie and I were joined by our friends, Shannon and Avery, and we headed north! The first stop in our trip was the Florence Lauderdale Public Library for a book talk. We really had a great time learning about Alabama, the history of coloring, and we even learned some new coloring tips and tricks! After the book talk was over, we enjoyed some local Florence flavor at Trowbridges (who is celebrating their 100th birthday this year). If you eat there, you have to MAKE SURE you get the pineapple orange ice cream, which is on the list of 100 Things to Eat in Alabama Before You Die. It's super creamy and delicious! After filling our bellies, we went to see Leo III and Una, the sibling lions on the campus of UNA, the Rosenbaum house (Alabama's only Frank Lloyd Wright house), and Ivy Green, birthplace of Helen Keller. We even got to see the infamous water well where Annie Sullivan taught her "water". The next day we drove through Cullman on the way home and stopped at the Ave Maria Grotto. This is one of those hidden gems in the state that everybody should go see at some point in their life. The dedication and artistry of Brother Joseph was incredible. 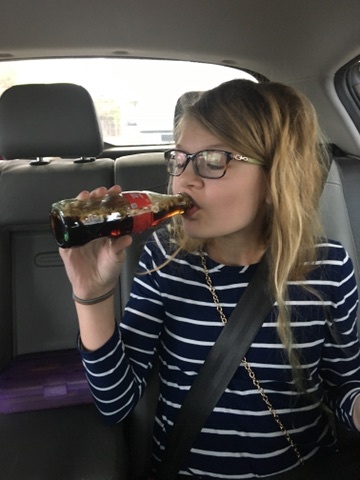 Our Alabama road trip came to a close with a trip to Whataburger, a visit to the marble quarry in Sylacauga, and a road trip classic... coke and peanuts! These 2 little girls had never tried this southern delicacy before... What kind of mother am I??? Backtracking just slightly, I wanted to say that throughout our entire trip, we had fun getting our Past Ports stamped. If you don't have one yet, you can get them HERE. If you don't know what they are, you can learn about them HERE. It's a really cool booklet that's $10 and you can go around on your own epic Alabama road trip getting stamps from all the 67 counties! In fact, you can use it in conjunction with your very own copy of Amazing Alabama - get your Past Port stamped and color the county you're visiting. Maggie and Avery already have 3 stamps (I've got 4)... how many do you have? Back before Christmas I had the privilege of meeting Midge Putnam, from Bullock County, at a meeting in Opelika. Midge is like a one-man-band, and I get the idea that she's really good at what all she is involved with! She works with the Red Door Theater, the Tourism Council of Bullock County, she's a Spanish Teacher at Conecuh Springs Christian School, she's an active mom, and she's also really involved in the local Girl Scouts! Anyway, we started talking about ways she could get me down to Union Springs for a series of book talks. It started out small (I was just going to come to a local bookclub and talk), but I had no idea how incredible this day would turn out to be! Several weeks ago, after she and I had already nailed down our plans for the bookclub talk, she sent me an excited email saying that ALL the 4th graders in Bullock County were getting their very own copy of my book, and would I mind coming a bit early to visit the schools. We visited 2 schools that day - the first one being Union Springs Elementary School Those kids were so excited and they asked really incredible questions. They quietly looked through their books and followed along as I talked about several of our state's 67 counties. Their Principal, Marvin Lowe, really should be proud of his smart, excited kids who are so eager to learn. And at Conecuh Springs Christian School, we were joined by Debbie Collins' sweet 4th grade class to learn all about Bullock County, coloring, the Bicentennial, and a whole host of other things that our state's 67 counties have to offer! A HUGE "Thank You" to people like Midge who see how endless the possibilities are when it comes to educating our youth and getting kids EXCITED about learning. 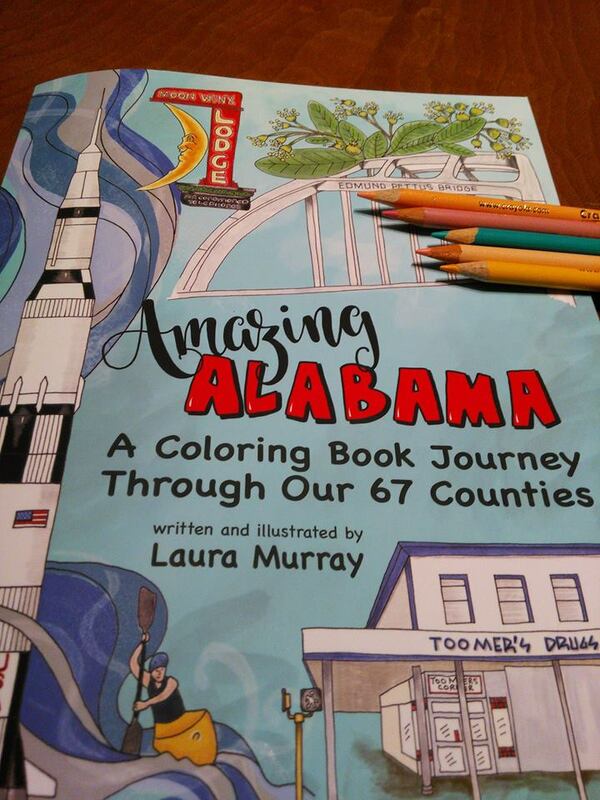 I know Amazing Alabama is a coloring book, but if I can get just one person to show a new interest in something they learn about our incredible state, then I think I've done my job! I'm so incredibly honored to be included among the other 3 incredible authors who are participating in this year's Read Alabama events in Jasper, Alabama. CLICK HERE to learn more about the event, get directions, or to add it to your calendar! Ok, I think it's pretty darn awesome that we have sold over 1500 copies of Amazing Alabama on Amazon... not to mention the other ways people can purchase my book (Books A Million, Barnes & Noble, NewSouth Books, my website, and at countless museums and gift shops around the state). The above map shows where in the country Amazing Alabama has been purchased from Amazon. Other than the usual suspects (locations around Alabama and the southeast), I've sold books to people in California, Colorado, Washington state, Missouri, Illinois, and Massachusetts (to name just a few). Therein lies my question: What (other than the incredible artwork and insightful research - heehee), compels someone to purchase a coloring book (from a relatively unknown author/illustrator) about a state all the way across the country? Did they live here at one time? Are they a coloring book collector like me? Are they getting ready to move here and wanted to learn a bit more about our incredible state? I'm going to back-track a tiny bit this morning and talk about something incredible that happened last week. On October 26th, Caroline Marshall Draughon Center for the Arts & Humanities (aka: Pebble Hill) hosted my Amazing Alabama book launch party and we really had such a great time! I talked about my childhood growing up NOT in Alabama, my research, gave a few fun facts about Alabama that I learned along the way, we had refreshments, I signed books, and we had a super fun coloring party! There were people in attendance that I knew, people I didn't know, and even a few students who were there for class credit and they were taking notes. NOTES! About what I was saying... about my COLORING BOOK! But it was made even more special by the fact that my Dad and Stepmom and also my Aunt drove 6+ hours to be here for it. A HUGE Thank You to Kellie Wilson for taking the great photographs. Not only is she a dear friend, but she's also a really talented photographer! November 1, 2017 was our official launch day! YAY! Now that the books are available for purchase, please take a minute to go review it on any of these great online retailers. AND AS ALWAYS, it's for sale on my website and also at NewSouth Books. Y'all, I LOVE seeing your gorgeous coloring pictures from Amazing Alabama. It's so exciting to see how much everyone is enjoying coloring in their books. Whether you color with crayons, colored pencils, markers or felt tip pens... I would LOVE to see your beautiful artistry! Please tag #amazingalabama or @alabama.pen.paper if you post to Instagram or Facebook so I will definitely see your fun colored Amazing Alabama county pages! There's something cathartic about sitting down with a box of colored pencils to color. Not only does coloring relax the soul, but it's really a wonderful experience to see something come to life on the page in front of you. 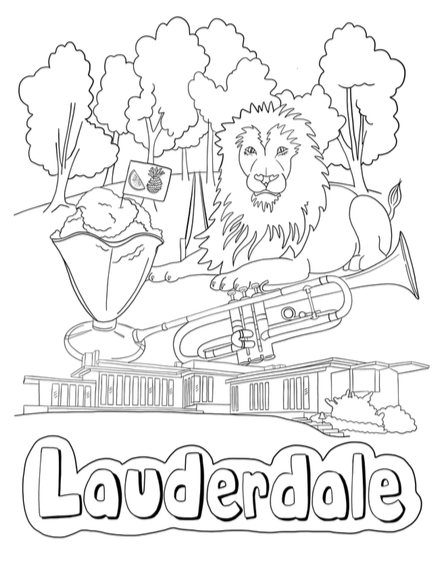 Something different altogether is coloring with a child. I wouldn't say that coloring with my 11 year old is exactly RELAXING. Yes, she may ask 50 questions per minute about what color I'm using, or what shade of blue she should use here, or how she should blend this section, but it's definitely a sweet bonding experience. Last Saturday she woke up and asked me for her very own copy of Amazing Alabama so we could color together. So for a large portion of the morning last Saturday, she and I sat on the back porch using my "good colored pencils" and coloring... together... talking... spending time together. I have to say, NewSouth Books is an AWESOME indie publisher who knows the value of grassroots marketing. They have come up with some SUPER ideas to promote the book! Last week we started out with an Alabama Living Magazine interview, an interview with Fred Hunter of Absolutely Alabama, and the Good Day Alabama morning show (WRBC Fox6) in Birmingham. Here I am in the green room (It's actually a GREEN room) at WRBC - waiting to go on Good Day Alabama. Click the above photo for the video. After I left WRBC, I headed to the Vestavia Hills Library in the Forest for a kid's after school coloring party! We had so much fun learning about different kinds of colored pencils, gel pens, felt tip pens, hatching/cross hatching, stippling, and we EVEN learned how to turn your Crayola markers into watercolor paints (yes, the paper is thick enough in Amazing Alabama that you can even PAINT in it without bleed-through)! Toward the end of the week I was in Huntsville at the Alabama Mountain Lakes Tourism Association's annual meeting at the Huntsville Botanical Gardens. That facility is gorgeous, the grounds are immaculate, and the food was incredible (especially the cupcakes).